Updating a room with paint is a great and inexpensive way to give it a new and exciting look. In fact, with some good paint selection tips, you can transform a room more drastically than you imagined. With the right combination of paints, you can even make a room look larger. Colors can tremendously affect a person's mood, and the color of a room can have an immediate and lasting effect on a person. Every homeowner aims to make his home nice and welcoming; since colors have the ability to create an atmosphere, it's important to really plan out your paint colors to make sure you create a comfortable room. 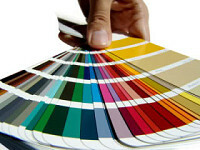 Read on for some great tips on paint colors and the moods they can elicit. The general rule for ceilings is to paint them in a lighter shade than the walls. But what about low or especially high ceilings? For these cases, it may be a good idea to consider not following this rule and to instead use a pale color paint. Low ceilings will look great with an ivory or light blue paint, while high ceilings will look great with an even deeper shade. If you have high ceilings and a dark floor, then pink and beige are excellent choices. Where you live plays a special role in determining the paints for your home. If you live in a seaside area, such as Long Beach, California, then the paint on your walls is more likely to fade to a heavy gray over time as a result of exposure to sea air. Fading occurs more with pastel shades of pale greens and blues. Do you live in the city? If you do, then why not keep up with the vibrant, urban, city theme and choose some exciting, bright, clear colors for your walls? The same goes for country living. Consider choosing paint colors to complement the natural colors of the surrounding country, such as greens and browns. Any given color can trigger a range of emotions within a person. For example, my childhood bedroom was painted in the prettiest lavender you could imagine. I loved it, and when I see a similar lavender, it reminds me of my bedroom and how happy I was when it got painted in that great shade of lavender. Someone without a personal connection to lavender would probably just pick up on the calm and pleasant feeling that lavender gives off. These colors create a sense of space and calmness. Neutral paints are great and popular, as they complement almost any decor style and also bring a sense of tranquility. Primary colors are great for children's bedrooms as they are bright, casual and informal. Consider painting an accent wall in a primary color for a quick boost to a room. Rich and deep colors go well with dark wood furniture and create a clean, crisp look for a room. These colors also create a sensual effect. Many people choose rich and deep colors for the master bedroom, and there are many accessories in stores today to round out deep colored bedrooms (such as dark sheets, pillows and blankets). Earthy tones create a warm and sensual atmosphere and are a popular pick for bedrooms and even kitchens. The kitchen is one of the most popular rooms in a home, so why not make it as warm and welcoming as possible. Serenity and the tranquility of the ocean: These are the moods and thoughts associated with blue, and with white together with blue. Blue is commonly chosen for bedrooms because it is a cool, calm color that fosters a sense of serenity. Black and white color schemes (especially contrasting black and white schemes) suit rooms with simple furnishings and have a sophisticated effect. Black and white is a great choice for a modern kitchen or bathroom. Deep, dark colors can create a more neutral atmosphere for bedrooms. These dark colors work well for dining rooms where a feeling of elegance is sought.